Each offers a pair of songs which he or she delivers, accompanied by various musical friends on guitar, mandolin, bass, tuba, drums, percussion, accordion, violin and viola. As you might expect, there is lots of fine harmony in the mix. The mood is warm and casual, cast in the glow of creative generosity and animated by first-rate songwriting ranging from heartfelt ballads to humorous ditties. NEW CD ON SALE NOW! 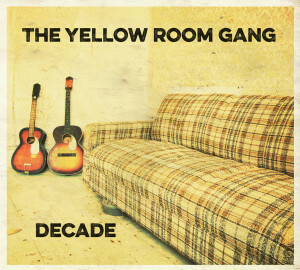 We’re celebrating our tenth year as a ‘gang’ who write and perform songs with a brand new CD! Featuring 16 tracks – 2 never before released tracks from each member of the gang. Always a great time and full house! Get your tickets at theark.org. In August of 2010, the whole gang booked two nights at Big Sky Recording studio in Ann Arbor and sold a limited number of tickets for a small audience to share in the recording experience. As a bonus, the gang prepared a pot-luck dinner that was shared before the concert. This once-in-a-lifetime event is immortalized on one CD the features all 16 songs as they were performed! We are thrilled to releasing this recording officially at The Ark in Ann Arbor on January 14th, 2011 at our annual Yellow Room Gang concert! Click on the album cover to pre-order!